Cervical artificial discs is a motion preserving system used for patients experiencing cervical degenerative disc disease and other cervical disc condition. C-fix is a cervical interbody anterior cage with an integrated internal screw fixation. It is indented to be used for cervical discectomy and fusion. The integrated design allows for a rigid screw fixation without an additional anterior plate The cage has an ultra-low profile which does not protrude out of anterior surface. CAPS is a cervical anterior plating system utilises 2.5mm plates for rigid fixations. The CERLOCK is a low profile anterior cervical plate system with a single step lock. COFS is a Cannulated Odontoid Fixation System Cannulated screw system that is used in the C1-C2 region of the cervical spine to stabilise odontoid fractures and to treat atlantoaxial instability. The cranio-vertebral junction (CVJ) is a collective term that refers to the occiput (posterior skull base), atlas, axis and supporting ligaments. It is a transition zone between a mobile cranium & relatively rigid spinal column. DAS is a cervical expandable corpectomy cage that can be expanded in-situ in a controlled manner. DAS ULTRA is a cervical expandable corpectomy cage integrated with ananatomically contoured plate with a one-step locking feature and an ultra-fast controlled implant expander instrument for quick implantation. ETHAN Cervical is a mesh cage used for corpectomy in the cervical region. The FUZER is the comfortable choice for patients experiencing degenerative disc disease of the cervical spine. 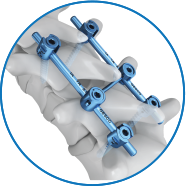 The FUZER gathers bone during decompression, bone bed preparation, and implantation. The self-packing of bone into the implant's chamber produces a local auto graft. The GAAS – Goel Atlanto-axial Spacer - is a GESCO exclusive patented system used in the C1-C2 Atlanto-axial joint, for basilar invagination, instability of C1-C2 joint and Cranio-vertibral anomalies . GAAS is a revolution in cranio vertebral junction fixation technique. Laminofix is a system that is used for laminoplasty procedures in the cervical and thoracic regions.